The majority of Americans are not using their hard-earned vacation. The always-on, 24/7 work environment has eliminated office boundaries and created the new challenge of making time to take time. American workplace pressures have produced ideal conditions for the rise of the work martyr. And that rise may not have reached its peak. In 2015, 55 percent of Americans combined to leave 658 million vacation days unused. The first generation of America’s work martyr era is here—and it is poised to not only continue the downward trend, but to accelerate it. The report, The Work Martyr’s Cautionary Tale, takes a closer look at who the work martyr is and the consequences of a work martyr’s decisions. 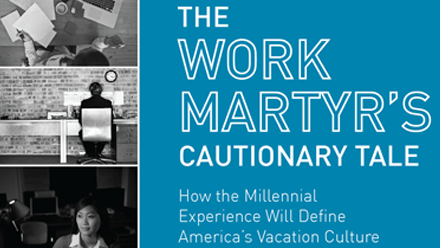 Of Millennials want to be seen as work martyrs. Workers who meet the work martyr definition are overwhelmingly Millennials. Nearly half (48%) of Millennials think it is a good thing to be seen as a work martyr by the boss, far outpacing the average (39%), Gen Xers (39%), and Boomers (32%). Of employees say they actually want to be seen as a work martyr by their boss. Not surprisingly, unhappy employees are more likely to buy into work martyr mythology. Forty-seven percent of employees who are unhappy with their job and 46 percent of employees unhappy with their company believe that it is a good thing to be seen as a work martyr by their boss. Those employees who want to be seen as a work martyr by the boss are also more likely to report feeling stressed at work.